For many bloggers, Pinterest is the #1 traffic source. In this post, I’m sharing my set-and-forget Pinterest setup and how it resulted in more followers (and therefore more traffic)! 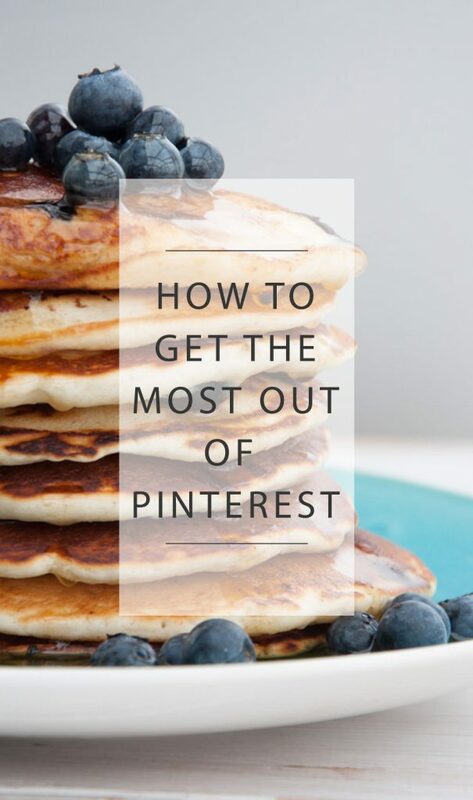 For me and many other food bloggers, Pinterest is the #1 traffic source. So it’s important to set up a profile for your blog as soon as possible and to optimize your actions on Pinterest. This doesn’t mean, pin as much as possible, but rather pin cleverly and time it right! In this post, you’ll find my complete setup and additional tips to get the most out of Pinterest for your blog. Disclaimer: Please note that some of the links below are affiliate links and I will earn a commission if you purchase through those links. I’m using all of the products listed below and recommend them because they have helped me get traffic to my blog. I want to start by telling you a little bit on how I was able to get from 4200 followers to 8000 followers in 9 weeks and therefore improving my weekly follower rate – on average – by 420%. 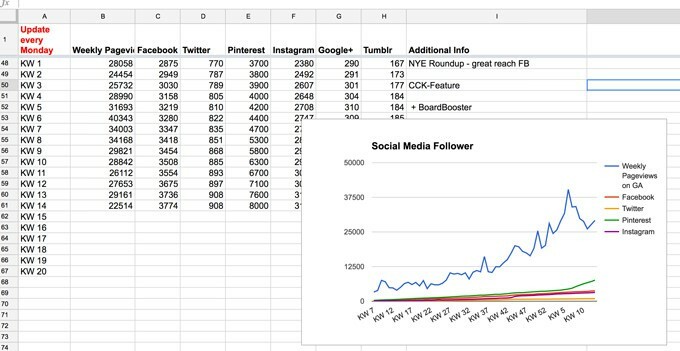 I track my social media followers weekly, so I can see which strategies work and which doesn’t. I can only recommend, you do the same, especially when you’re trying out new campaigns, strategies… it really helps to keep an overview and lets you focus on which tactics work for you and your blog. You don’t need any fancy tracking tool, a simple excel spreadsheet works great! I love tracking and analyzing data, so I wanted to share my insights. I started tracking the Pinterest stats when I had 314 Pinterest followers. 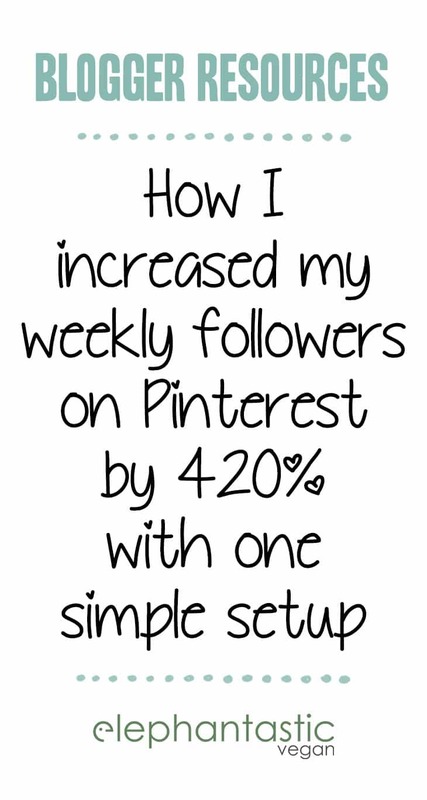 When I was at 4200 Pinterest followers, I tried a new strategy (I’ll include a complete overview over my Pinterest setup below!) and it helped me to almost double my followers in only 9 weeks and it’s still going strong. As for tracking repins, clicks and impressions, Pinterest offers an Analytics section in your dashboard. You have to change your account to a business account, but it’s easy and free and I don’t see a reason why you shouldn’t do it. Here’s how to enable Pinterest analytics for your account. With my new setup, I was able to not only grow my Pinterest followers but also to increase repins by approx. 11% and click-throughs by 30%. When I started with Pinterest I pinned every single pin by hand – that was a lot of work and because I’m in Europa, American users were active when I was asleep, so I wouldn’t reach them. So I started looking into scheduling tools. There a couple ones out there, and there’s sometimes a discussion among bloggers which tools are the best. I found that not one, but a combination of two scheduling tools worked best for me: Tailwind & BoardBooster! To find out more about follower and traffic growth with Tailwind, check out Tailwind’s blog post Typical Results of Tailwind for Pinterest Users. BoardBooster is different. Here you have to pay per pin, but it’s not that expensive. I use BoardBooster for only a couple of pins (under 500 pins per months, so it costs me $5 per month), but it’s really powerful. When I started adding BoardBooster to the mix, I noticed a huge improvement in followers! Create a new (or use an existing) personal board, that you want to push (I made a board and called it “Vegan Goodness“). Go to BoardBooster > Pinning Tools > Scheduler. Set the frequency, how often do you want BoardBooster to post new pins on the board? (I used 3 per day), I set the time setting between 6-8pm and click submit. Now BoardBooster automatically creates a secret board; pins from the secret board will be posted to the board you selected in step 1. Now select the board and click “Add” where it says Pin Sourcing. I’m using board monitor to let BoardBooster automatically look for viral pins to add to the board. You’ll find all the settings in the screenshot below as well. For the “Board URL to monitor” enter a large community board URL (I used the group board “Vegan Community”). Disable the domain filter. Skip Pins from eCommerce sites, video pins, animated gifs. Include short pins and skip pins with less than 3 repins. Select the status “working” and let it source about 4 pins (select at least the number of pins you instructed BoardBooster to pin to the selected board). Automatically approve pins for scheduling. Click save. That’s it! 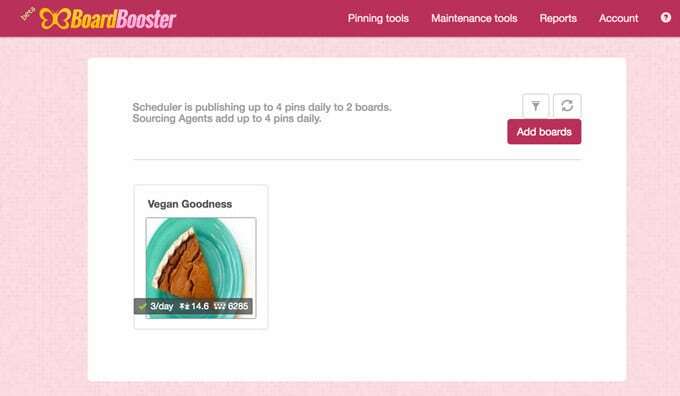 Now you’re all set and BoardBooster automatically looks for viral pins and schedules it to your board. Of course, you can adjust all the settings to your needs, but this is the setup that works for me. When you select a community board to source your pins from, make sure it fits your blog’s and Pinterest account’s theme (e.g. choose a dairy-free community board for a dairy-free blog or a blogging tips community board when your blog is all about blogging tips). How do I know that BoardBooster is responsible for the increase in Pinterest followers? Well… it all started when I began using the tool and many of the followers subscribed to the “Vegan Goodness”-Board directly – I never had any extra followers on that board, so it had to be caused by the new strategy. Long, vertical pins tend to do better on Pinterest than horizontal short images. Want to see how my pins look? Don’t pin exclusively your posts/pins but also share recipes/posts from others. To find suitable group boards, I like to use PinGroupie. Enter a keyword (e.g. recipes or food or something more in your niche) and order them by followers or by repins to find the most active/engaging ones. Then click through to the boards, read the board’s description and ask to join as of mentioned in the description (most often by leaving a comment on one of the board owner’s pins). Less is sometimes more. If you pin too much (70 pins per day? 100 pins per day? ), you risk landing in Pinterest jail. Yes, there’s Pinterest jail and it’s not pretty! Okay, that’s it! I hope you found this post useful, let me know in the comments what you think! Is Pinterest a good traffic source for your blog? 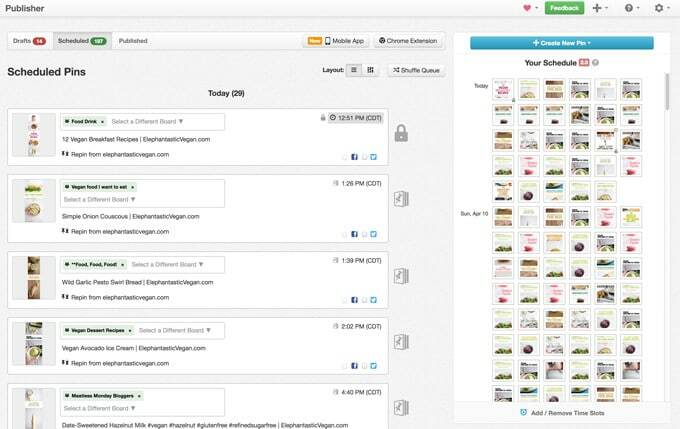 Are you using a Pinterest scheduling tool like Tailwind? Any additional tips you want to share? Questions? And you can find even more useful articles for bloggers on my blogger resources Pinterest board. Great info! I was just considering adding Tailwind to the mix. Great article thanks! I have been using tailwind which I love, but I had no idea that Board Booster could automate things so easily. Will be looking into adding that too! The tool I like for managing and automating my Pinterest account is www [dot] PinPinterest [dot] com. It has got me about 55k followers in the last 7 months.